Tag Archives for " belkin "
My friend Guy Kawasaki wrote an article recently about the tools he relies on when he goes on the road. I seem to be doing that quite a bit myself these days so I took stock of the tools that I’ve come to rely on to get work done when I travel and thought I would share them with you – got any you care to share? Sandisk 8GB USB Drive – This is just a great back-up tool, but I also carry portable a version of my Firefox browser that contains all my data such as bookmarks. This is incredibly handy if I even just want to jump on the hotel computer. Vitorinox Swiss Army Luggage – Pretty much love everything from Swiss Army, but love the quality of the carry on luggage and bags. Dropbox – This online file storage service works great and is very easy to integrate into my offline storage. This allows me to grab presentation files and view them on my iPad or send them to event organizers. iPad – This has become my RSS reader and book reader of choice, but I also use it as a lightweight email tool and browsing and bookmarking tool. Of course, it still has coolness factor too. Moleskin notebooks – most of my actual work is done digitally these days, but I still think best in analog. I jot pages of notes at 40,000 feet and love filling these little paper notebooks. 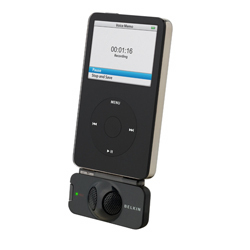 Belkin Tune Talk iPod Mic – I can record in the field interviews on this stereo mic and save the recordings as high quality WAV files on any iPod. Travel Power Strip – Create your own power center with USB chargers for that one outlet in the airport. Good way to make some BFFs for sure. Read and Review file – This one comes from David Allen’s Getting Things Done system. I chuck paper in this file all week and when I jump on a plane I’ve got contracts and reports and other interesting things I can finally get to. Copies of Wired, Inc and Fast Company – I subscribe to a handful of print magazines but seem to save them for travel.